Art-Barry Kitson and Robson Rocha do their best at trying to fill the book boots of Nicola Scott. In a trade it’s going to be obvious this is a fill in job but for a single issue it’s not bad. Dynamic– The gathered heroes of Earth 2 have an interesting dynamic with diverse personalities that surprisingly shine through regardless of their numbers or what’s taking place. Story– Picking up where last issue left off. Hawkgirl is carrying Batman, Aquawoman and some agent. They can’t seem to outrun the parademons. Aquawoman uses her powers to take care of the parademons before heading into the ocean depths. The heroes then rendezvous at Batman’s cave. All around the word religious locations and building get bombed by evil Superman as he proclaims, “there is only Darkseid”. Back in the cave they expose Val directly to sunlight in hopes that his Kryptonian physiology hoping he will be the best shot at defeating Evil Superman and saving the world. 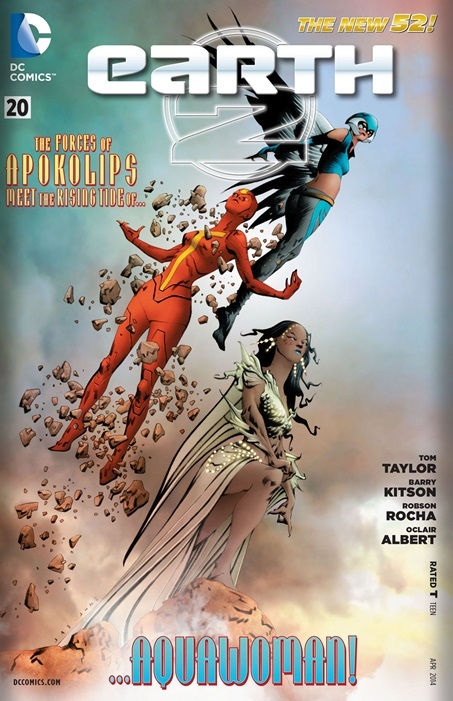 Diversity– Hawkgirl and Val-Zod are black. Aqua-woman has a distinctive Latino features, Dr. Fate is Middle Eastern while Batman and company are all white. This is a very diverse cast, easily the most diverse cast out from either Marvel or DC. Action-Aqua-woman brings it this issue and it’s forever been etched in my mind that it has been brought. Very cool display of power. Potential– I really like the organic manner in which Earth 2 has been expanding. At first the focus was on Flash/Jay Garrick and Green Lantern/Alan Scott, now the focus is on Batman, Val and Red Tornado/Lois Lane. It’s good to see the changing cast and how they will be connected to the earlier heroes as things progress. Cover– Minimalist, plain and just not what I expected or wanted. White Wash- So! The elephant in the room? Connor Hawke the dark skinned mixed race kid that once belonged to Green Arrow/Oliver Queen and Sandra Moonday Hawke is officially a white dude with red hair. YAH! I’m just going to leave that here. I knew nothing about this Earth 2 concept until you mentioned it here. Seems interesting to see a more diverse superhero world. I am also familiar with Barry Kitson’s work when he was the artist of several Superman issues in the 90s that I liked.